I will be the first to admit, the moment I laid my eyes on Gears of War on the Xbox 360 all those years ago, my heart was captivated by the sheer grittiness of the graphics, in addition to all of the action-packed gameplay that came along with the game. Of course, expanding the use of one’s imagination within the game makes perfect sense, and sometimes, don’t you just wish that you could feel some cold, hard steel in your hand that comes in the form of the HammerBurst, especially when you are faced with an irritating colleague in the vicinity? Well, this is where the $899.99 Gears of War HammerBurst Prop Replica comes in handy. Yes sir, I do think that the price tag attached to it might seem to be rather excessive, but do bear in mind that this is a hand-cast, hand-finished, and hand-painted work of art, measuring 36 inches in length and tipping the scales at 35 pounds. With this, you will be able to tote the primary infantry weapon of the Locust around, throw a menacing look at whoever crosses your path the wrong way, and watch them flee in terror. Too bad it does not come with the melee option of the chainsaw bayonet, but at least you get larger caliber rounds and slow-automatic fire. 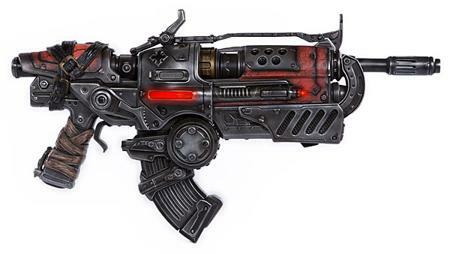 The Gears of War HammerBurst Prop Replica will come with working LED effects and only 500 of these puppies will be in production, so get them while they’re still hot.